PayPal account is not required. Select “Pay with Debit or Credit Card” option. Vehicle stops are one of the most frequent interactions peace officers have with the public. They also put officers at a significant risk of being injured or killed by criminal offenders. This course is for patrol officers, gang officers, crime impact teams or detectives who conduct vehicle stops for investigative purposes. The “Vehicle Defense” course is a 2-day format concentrating on the tactics to fight in/out and around vehicles. 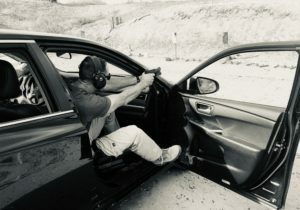 Topics covered in this class are vehicle approaches, cover vs concealment, counter ambush techniques, ballistics, auto-glass composition and the effects of angled fire. A strong emphasis will be placed on developing and imprinting proper techniques under pressure. Range drills will include conventional and unconventional shooting positions, passenger/driver side ambushes, use of cover, movement, support hand shooting, transitions as well as multiple target engagements. It is recommended that the student bring knee pads, elbow pads and suitable foot wear for movement”. This is NOT an entry level course, students should have a solid foundation in the fundamentals of marksmanship, weapon manipulations and a proper mindset. Gates open at 8:00. Class starts at 8:30. There will be a 1-hour lunch break. We at Sentinel Defense have the upmost respect and admiration for the men and women in Law Enforcement who will leave their own families everyday and tirelessly go out and protect the citizens in the communities they serve. Last night LAPD - Newton Division Gang Enforcement Officers were involves in a gun battle that left a suspect dead and Officer Trujillo severely injured from multiple gunshots wounds. Please support Officer Trujillo’s in his recovery efforts and donate. Every little bit helps. Prayers for a speedy recovery and god bless the men and women of the thin blueline.